Cabot- is there a realistic chance to fight them? Re: Cabot- is there a realistic chance to fight them? 3. Start & see through the 3 letter process & have a very good chance beating them. what is really going on,it may be a few years old now but it explains it very well. watch out for the next letter being a letter before action, if this is what they next send out to you then they will be looking to take this to court. keep your whits about you and shout if you receive a letter before action. I will watch out for it and definitely keep posting. Thanks a lot for your help. Hi guys. An update. So far no response for letter 1 therefore I'm sending letter 2 today. Same here. Third letter sent a few days ago. Hi. After sending get a third letter to Cabot on 31 August I have received a letter yesterday. 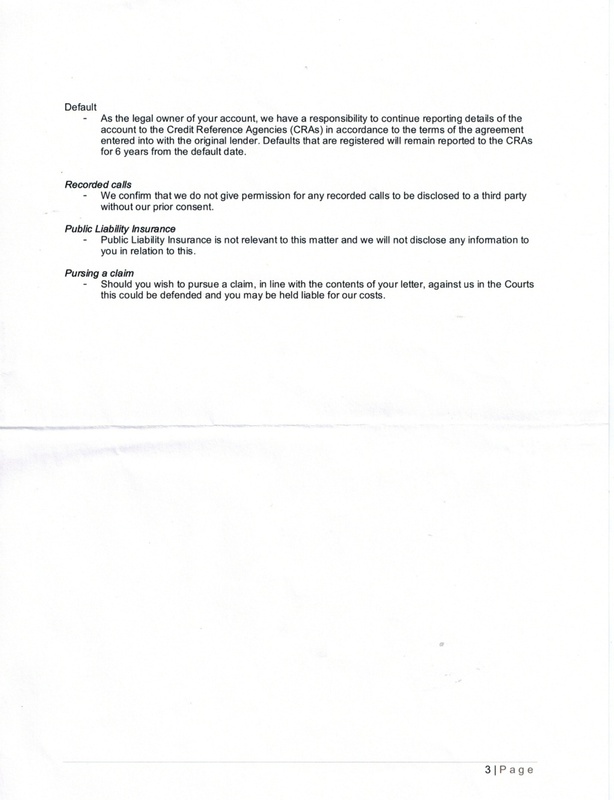 This letter is in a general mood that they do not have to be providing me in any documents, that they receive many letters like mine and my claims doesn't apply to English law but to American one, and if I keep sending further letters with inaccurate or irrelevant claims they will not longer respond to it but will keep contacting me to reach solution for repayment. Also they said that if I have a valid dispute reguarding them they can help to investigate my concerns. And they do not see a reasons behind my claims for documents. 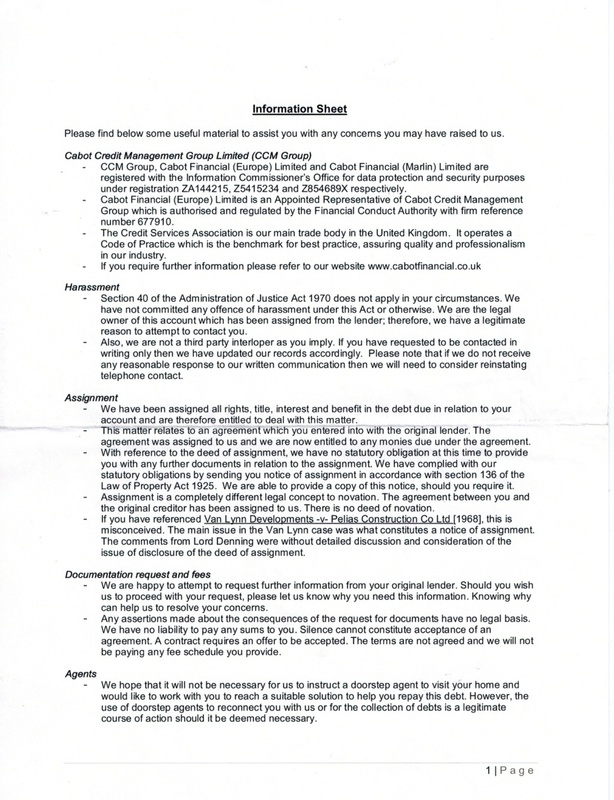 Along with a letter they have sent a 3 page sheet where are giving explanation why my claims are not valid. I would love to attach it for your review but I can't see how to do it in this forum. Can someone let me know howhat to attach a file here? So, what do I do now please? Letter has no signature and no name. It is just send us Cabot Financial. It was not sent as recorded delivery. Do I just ignore this one and continue with estoppel when time comes ( after 30 days from the last letter)? Or should I refer to this letter somehow? Also they claim that estoppel by acquiescence have no basis in England. Please let me know what shall I be doing next? Is that all they have sent you ? Its clearly a template letter which they believe covers all arguments they have heard. I would respond along the lines of: I am in receipt of your template letter dated xxxxx and received xxxxx. Firstly it is now recorded in my records that I have requested on three (3) occasions documentation relating to this alleged debt ,and as to date you have failed to supply these or give an explanation for your failure. As regards your response ,you appear to have made a legal determination regarding the Lord Denning judgement . Therefor I now require the name and legal qualifications of the individual who has made that determination . I also note that you are threatening to send 'doorstep agents' . Take Notice I am now giving Notice that your implied rights access are hereby removed. Hi yes that's all. Along with a letter in which they claim that my requests has no base in UK law and are irrelevant and they do not need to be sending me any documents. re the estoppel it won't hurt to send one ,although they tend to ignore them. Ok so I will send them a letter as you suggested and if they won't respond I will follow with estoppel when time comes. Thank you again for your quick response. Much appreciated, really. 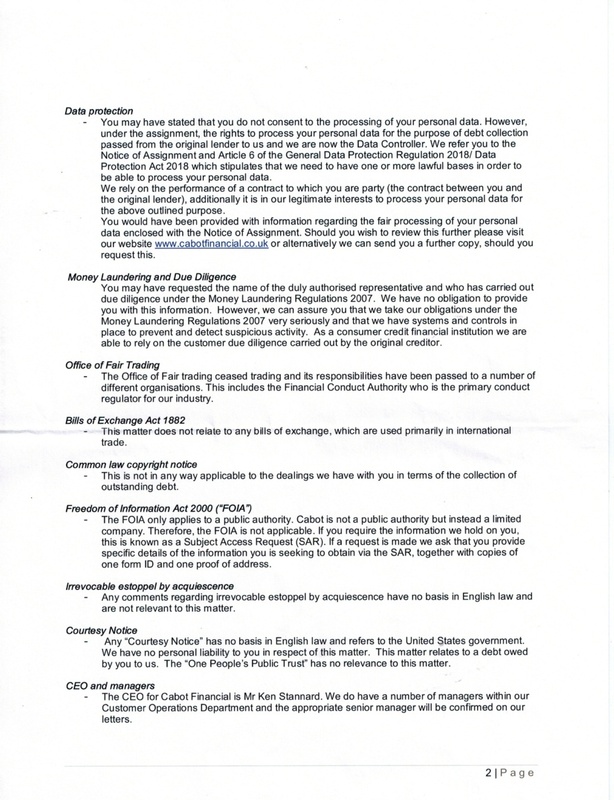 Hi guys, Today I have received exactly the same letter as on June in which they telling me that they didn't hear from me therefore they usual approach would be to instruct a solicitor firm..., so basically like all 3 letters plus the one I have sent them last time as a response to their information sheets (attached in my previous posts), has never happened. Now I am really getting worried. What should I do next? Should I just stick to my guns and reply again that as was mentioned previously I am still awaiting for requested documents? What do you think please? I hope you sent all your letters by recorded mail. sent by myself to you was sent 'signed for' and I have evidence to show all were delivered to you and signed for. In which case are you suggesting that Royal Mail has committed fraud ? if so, it will be my duty to inform them immediately. :-)))))) yes it was all sent 'signed for' and i have printed all delivery evidence. Thanks. I will do that. Thanks for helping. I will also add that in their last letter they have asked me to 'stop sending them this kind of letters' ( 3 letters they meant). ask them to stop sending ' this type of letter' as they know full well you have written to them recently. A lot of claims are bluff. Many ring up to make arrangements to make small payments, not realising they are acknowledging the debt and ruining their statute of limitations chances. The new Getoutofdebtfree website is trapping people into making arrangements, and many will not realise this could be damaging to them. Debt chasere trick you into arranging to pay over time, then they turn on you after you have reset the 6 year statute of limitations. This website and the original are a community of people who fight injustice and use every legal means to do so. In addition to the advice here, make sure you dont have much money in your bank acc, dont show your assets. People will not claim if there is nothing to acquire. Believe me they have access to all your records. I am not a rebel, but the banks have behaved criminally...see Nigel Lawsons book.....in 2008 bankers should have been jailed. Your debt is not caused by you. Devaluation of the pound makes you spend more to live the same lifestyle. Remember LIBOR fraud? sent you an e mail last night ? Do you know for a fact that OCs and DCAs can access your bank account, if it's not part of the original OCs banking group?